There are 403 paper beads in the jar. Boy, I can’t believe I made that many! Nyny, of Orgami Centeral, had the closest guess without going over at 375. Congrats, Nyny, on your win! For my first blog contest, I wanted to do something fun that I hadn’t seen before. I decided I would have a “Guess How Many Beads in the Jar” contest. I made these beads out of scrapbooking paper, and they looked so pretty in the jar that I left them there as a decoration instead of making any jewelry out of them. By doing this contest, I’m not being a very good marketer–I’m not sending you to my jewelry store, Aimee Dars Designs, to look at my pieces. So I would appreciate it if you would head over to the store and take a look at the offerings. 2) Send your entry by August 5, 2008 for consideration. Only one entry per person. 3) The person who guesses the closest without going over wins. If no one fits that bill, the person who is closest and has gone over wins. If the winning number is selected by two or more people, a drawing will determine the winner. Any single item in my jewelry shop up to $25.00. Alternatively, you may take $25.00 off a single item that is priced over $25.00. Not only do I love the subject matter of this piece, I love the collaged text, the style, and the colors. 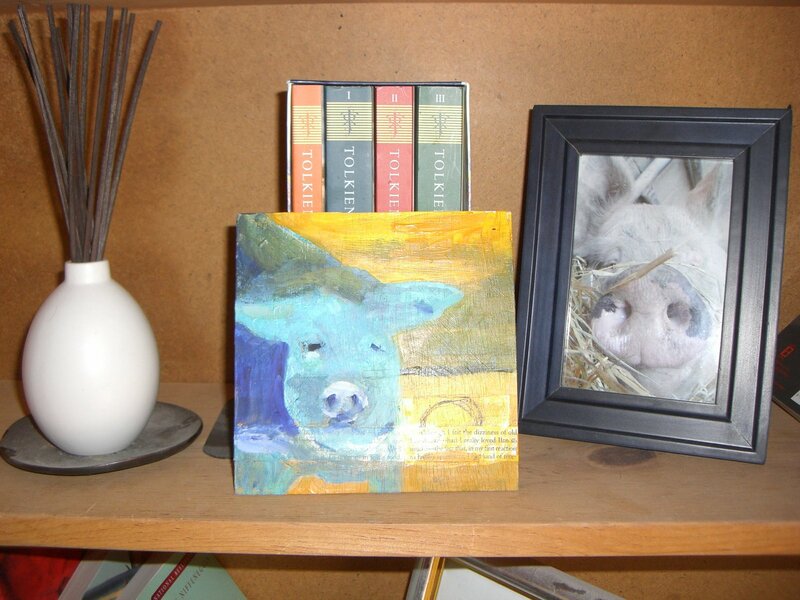 Pamela has a number of other farm animal paintings in her shop that are phenomenal, and as soon as I start getting a regular income again, I hope to add to my collection! Here is a sampling of them. If you would like to learn more about Pamela’s work or purchase a painting of your own, click on the Etsy mini below and you will be taken to her shop. 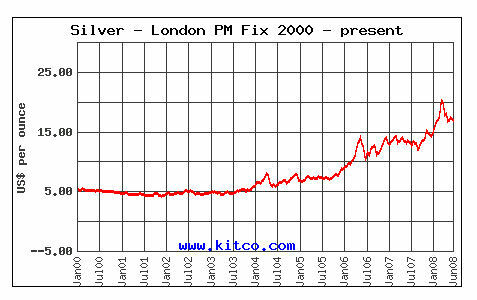 The precious metals market continues to be tumultuous. Gold closed today at 893.70 while silver closed at 17.34. Copper closed at 3.8262. Thought this isn’t as bad as it has been over the past few months, the high prices affect jewelry supplies. I went to one bead store, and they aren’t even stocking sterling silver wire because of the high price of metals. In the Etsy forums yesterday, there was a good thread about the best outlets for sterling silver wire. Gina, aka Chasing Beads, created a beautiful necklace she named after me! It is a lovely piece of jewelry and I’m so touched and honored to be its namesake. Please visit Gina’s shop and show the necklace some love! While you are visiting Gina’s shop, check out her other great jewelry. She designs beautiful necklaces and earrings. She also runs the shop Chasing Part II, featuring designs under $35, destash, and promotional bookmarks (by special order only).